Just a short update on the forecast for Halloween, which remains more or less on track. As of 4pm CT we’re in the midst of daytime-heating driven thunderstorms firing up along a boundary running through the Houston area. We’re hoping to see some of this activity die down between 5pm and 7pm, as the sun goes down, but we can’t guarantee it won’t rain in your area. If you’re trick-or-treating, the best advice is to seize the moment when it’s not raining around sunset; but remain relatively close to your home or vehicle. While there should be fewer storms across the area around sunset, we’re still concerned about the potential for strong thunderstorms and other threats popping up quickly. If you hear thunder, please take shelter. The main event will come a little later this evening, with the arrival of a cold front and a line of severe thunderstorms moving from northwest to southeast. The timings we shared this morning remain pretty much accurate. Along with the warning messages about the potential for some heavy downpours, high winds, and other severe weather, the National Weather Service went ahead and pulled the trigger on a tornado watch for much of East Texas. It expires at 10pm, but once the front passes through your location, and the rains stop, you can consider the need for the watch ended. Please remember that a tornado watch simply means that conditions exist for the possible formation of tornadoes, not that one has been spotted. And while it is certainly possible for tornadoes to form this evening, we don’t envision a huge threat. All the same, it’s going to get briefly nasty out there as this cold front blows through Houston tonight. Please have plans to be somewhere safe during the passage. Unfortunately, we don’t have a whole lot of good news about the forecast for Halloween, although we’re not ready to declare trick-or-treating a bust. For pretty much everyone, we expect trick-or-treating this evening to be a “game time decision,” and parents will have to be attentive to thunder, because scattered showers and thunderstorms will be possible during the evening hours. Later, for Halloween parties, we have concerns about the roads late tonight as storms associated with a cold front move through. By the way, if you’re so inclined, we’re now posting to Instagram if you want to follow us there for updates. Our forecast for Halloween remains more or less the same, with two main threats for the Houston area. There are thunderstorms this afternoon ahead of the cold front, and then later this evening the cold front and almost certain storms accompanying it. This morning, we’ll see scattered light to moderate rain showers, but our concerns really won’t kick in until this afternoon. By this time an unstable air mass, temperatures in the mid- to upper-80s, and ample moisture will create an environment that is favorable for thunderstorms. Short-range forecast models show at least scattered thunderstorms firing up across much of the area between 1 and 5pm. Some of these storms could produce locally heavy rainfall. The real question is when these storms wane—it seems possible, and perhaps even likely that they will begin to die down toward sunset and the loss of daytime heating. This may create a window early this evening in the range of 6 to 8pm for kids to get out, about, and grab some candy. We’re hopeful, but far from certain. 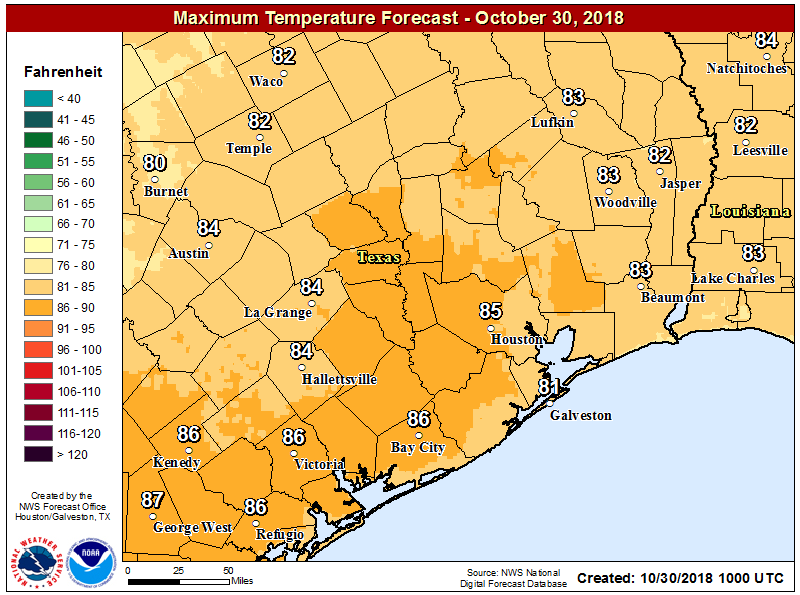 However, this window may shut quickly, especially for northern and western areas, such as Sealy, Tomball, Cypress and The Woodlands as a cold front sweeps down toward the area. Models generally agree that a line of strong and potentially severe thunderstorms will develop along the front as it moves from northwest to southeast across the area. We have concerns about abundant lightning, heavy rainfall, damaging winds, and potentially hail. 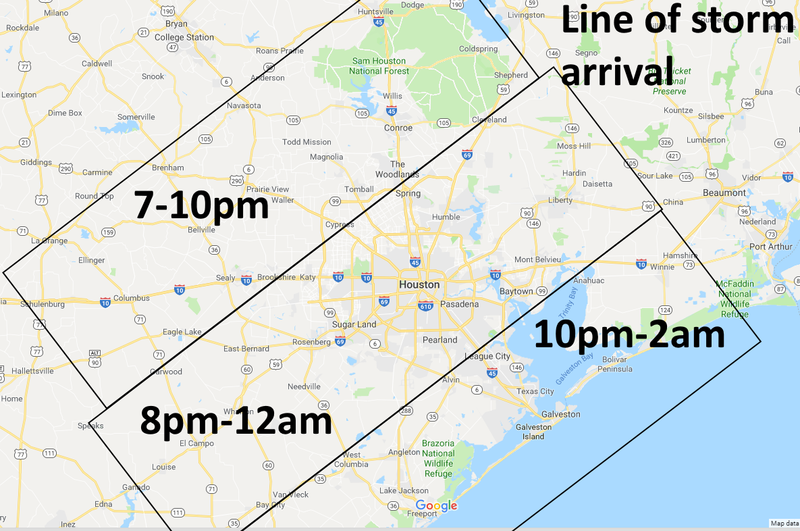 As far as timing, our best guess is that these storms roll into northwestern areas of Houston between 7 and 10pm, central parts of the city from 8 to midnight, and coastal areas from 10pm to 2am. Between this afternoon’s thunderstorms, and the certain overnight rainfall, we expect to see some healthy precipitation totals for most of the area. 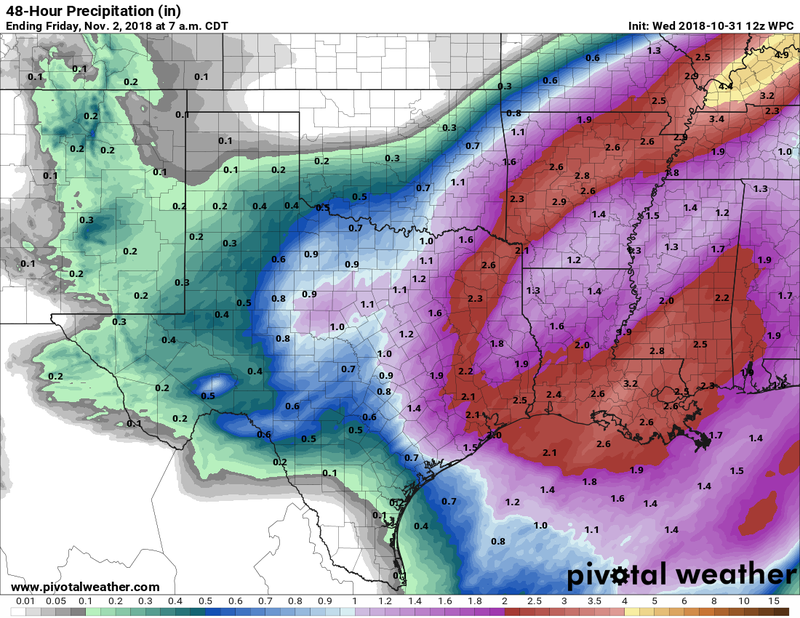 We now expect most of the Houston region to see about 2 inches of rain, give or take. However, we probably will see some isolated totals in the 4-inch or greater range for hardest hit areas. This will probably cause some temporary street flooding tonight, so again if you’re planning to be out in roughly the midnight time frame tonight, please take extra care. 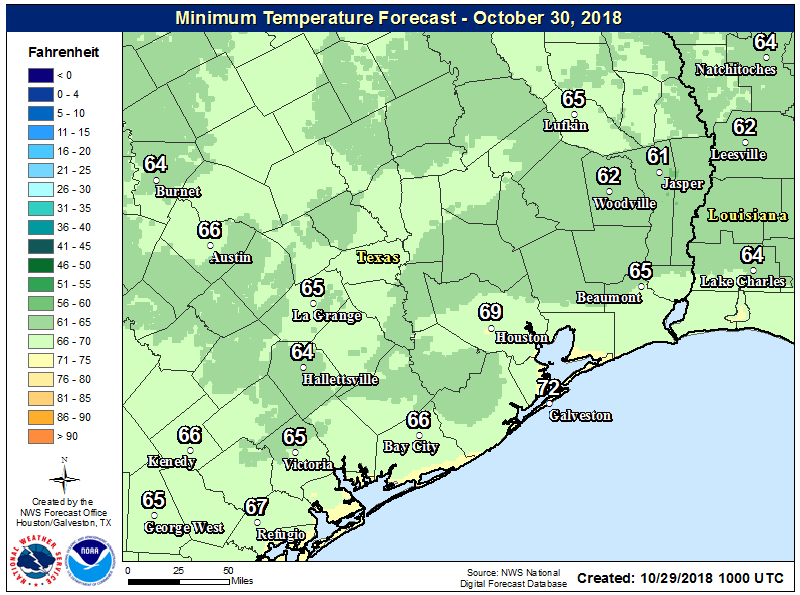 Overnight lows have nudged back up this morning, ranging from the upper 50s in Conroe, to the upper 60s in central Houston, and lower 70s just along the coast. Our weather will remain warm-ish through Wednesday, after which point a cold front will make for gorgeous fall weather for the Thursday through Saturday period. Speaking of that cold front, it will spark a round of potentially strong storms later on Wednesday, and this will certainly affect some trick-or-treaters. Much more on that in the post below. Humidity levels are back to near 100 percent this morning for most of Houston, as our old friend the onshore flow really kicks in. As a result, we’ll see an at-times breezy day, with some gusts possible above 20mph as southerly winds get flowing. The increased moisture will manifest in some clouds, but today should still be a partly sunny affair, and rain chances remain near zero (can’t rule out a very few isolated showers). Expect highs in the mid-80s today, and a night in which lows don’t fall much (if any) below 70 for most of the area. With slightly warmer temperatures this morning across the region, we’re seeing some fog developing. 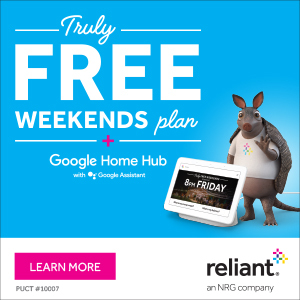 The National Weather Service has issued a dense fog advisory for the southwestern part of Houston, including the cities of Alvin, Angleton, Bay City, Clute, Freeport, Lake Jackson, Palacios, and Pearland, until 10am. Please drive with care this morning. Otherwise, we’ll see modestly warm and mostly sunny weather for the next few days before a cold front approaches on Wednesday. And yes, we’re still concerned about the potential for storms to disrupt outdoor activities on Halloween. Winds are calm now, but will generally flow from the southeast and southerly direction today, bringing more humid air back into the region. This should allow high temperatures today to reach up into the mid- to upper-80s. Rising humidity levels will help keep low temperatures on Monday night in the upper-60s for inland areas, and low 70s along the coast. Another warm day, with highs in the mid- to upper-80s depending upon cloud cover. Yes, after several fine, sunny days we’ll see the return of some clouds along with at-times breezy southerly winds. These winds will lift moisture levels, which will help fuel the potential for storms by Wednesday night.